The iBeacon has been all over the interwebs lately. Here’s a riff on the Arduino Pro MIni that adds a BLE module. It can be used to make an iBeacon clone. You can also hack a VTag keyfinder to operate in much the same way. [Michael] wrote in to share his crowd funding campaign. He is a school teacher and wants to publish a detective story that gets kids excited about STEM. Our own [James Hobson] made the first cut to be [Adam Savage’s] new assistant. He’s the [TheHacksmith] (read our staff page if you don’t believe us) and is the third entry featured in this vignette. Apparently they’ve got something against Canadians because they say he’s ineligible due to his nationality!? If you’ve ever been confused about the features of different Xbee modules this comparison chart may be of assistance. A couple of weeks ago we learned about a contest put on by TheControllerProject. [TouchStone936] gets credit for quick, easy, and functional. His solution to making shoulder buttons more accessible includes hot-glue, a golf tee, and a binder clip. Pretty clever! Wanting a better color of backlight for his eReader, [Vivek Gani] cracked it open and applied Kapton Tape as a gel to soften the hue. Our tips line recently received an influx of wearable LED projects, both for casual and professional wear. [Elizabeth] and [Luis] have created the Lüme wearable collection, aimed at accessorizing by adding adjustable accent colors to jackets, t-shirts and dresses. The electronics are custom-made, built around an ATMega32u4, and each is Bluetooth enabled to interact with a user’s cell phone. From the phone, you can change colors, sequences, set up events, and even take advantage of an “inkdropper-style” feature that matches the color of the LEDs to any object you point your camera at. [Michal’s] project is an entire suit for a dance and laser show entitled “Tron Dance”, which uses several RGB LED strips placed on key points of the wearer’s costume. It looks like [Michal] has intentionally avoided the joint areas to prevent any problems with breaks or bends, but still manages to place enough to cover the entire body. We aren’t sure what controls everything, but you can watch it go through various sequences and survive an onstage performance after the break. Finally, in yet another kind of performance, magician [Kiki Tay] has built a jacket that’s overflowing with RGB LEDs. [Kiki] wanted wearable LED control that could be used in various situations without having to re-invent the wheel each time, so he developed his own board — the LED Magician: an Arduino-compatible solution. The board has 12 outputs channels, drives 50+ LEDs per channel and features 12 on-board LEDs that display a preview of the output. To make interactions user-friendly, [Kiki] has provided 32 built-in sequences and adjustable speeds that the user can program via 4 buttons on the board. If that isn’t enough control, there are some options for external control as well. The jacket itself runs off a hobby LiPo battery and is blindingly bright: stick around after the break for a video. [Andrea] recently moved into an apartment with a few of his friends. Unfortunately the bathroom lacks one of the most important things — A fan. Or at least a window! Using the case of an air freshener, a simple DHT11 Humidity/Temperature sensor, an LCD, a 12V fan, and ATmel328 microcontroller, he created this handy gadget. When the humidity in the bathroom passes the 50% threshold, an LED flashes to prompt the user to open the door. After a short delay, one of the transistors flips causing the moist air to circulate out of the room. We’re surprised the little 12V fan is powerful enough to clear the room, but apparently it helps a lot and can clear the room in less than 20 minutes. To see it in action, stick around after the break. The Budapest hackerspace did some joint work with a local ham radio club and created an SSTV beacon housed inside a CCTV case that takes an image of its environment and transmits it using slow-scan television over ham bands. 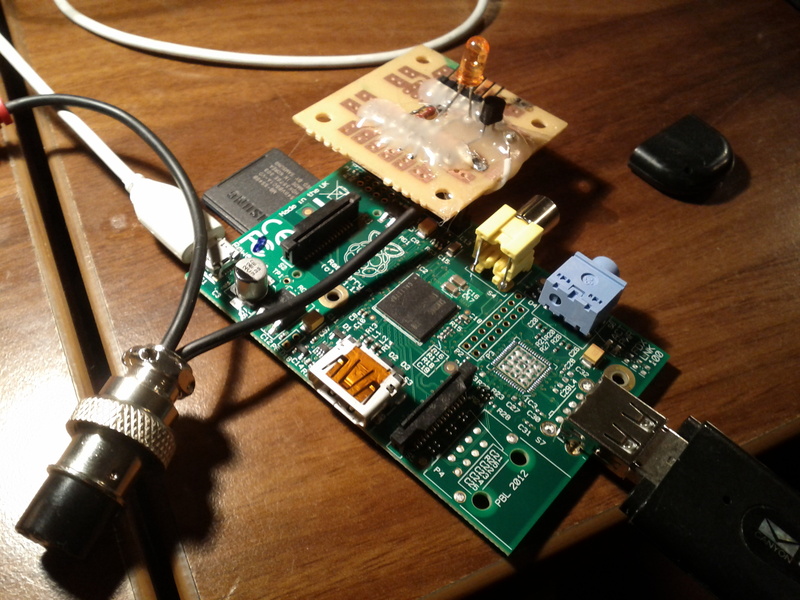 As the title says, the build uses a Raspberry Pi to process the image taken from its camera and then transmits it over the air using a Ricofunk UHF transceiver with a main frequency of 433.425MHz. On the software side, PySSTV is used to convert images to frequency/time tuples, UNIXSSTV then creates the actual audio file and finally sox plays it. To avoid screwing up the Raspberry SD card, every part of the filsystem is either mounted in read-only mode (things like /home and /usr) or uses a ramdisk (things like /tmp and logs). The plans, schematics and source code are available, so they hope that other hackerspaces will join the ranks!